The human gut flora has 10 times more bacteria than the body has cells, but the majority of these bacteria should be located in the colon. Too much bacteria, even of a nonpathogenic nature, overgrowing in the small intestines can lead to various digestive and systemic symptoms as well as nutritional deficiencies. This article will discuss these symptoms, the common nutritional deficiencies that often result, and successful dietary treatment and management strategies dietitians can employ to treat SIBO and therefore IBS. SIBO and IBS symptoms are the same: abdominal distension, flatulence, cramping, diarrhea, and constipation. These digestive symptoms result from both the high osmotic activity and fermentation potential of incompletely digested and unabsorbed carbohydrates present in the small intestines. After following the prescribed treatment plan and confirming the eradication of SIBO with a posttreatment breath test, dietitians can administer nutrition therapy to patients. Besides symptom management, the goals of diet therapy should include repairing the intestinal lining, optimizing nutritional status, and preventing recurrence. Foods containing FODMAPs (fermentable oligo-, di-, mono-saccharides and polyols) also can ferment in the small intestines and therefore should be limited if they induce symptoms in SIBO patients.2 FODMAPs include fructose (eg, high-fructose corn syrup, agave syrup, honey, apples, pears); lactose (eg, milk and yogurt); fructans (eg, wheat, barley, rye, onions, garlic); galactans (eg, legumes); and polyols (eg, sugar alcohols, mushrooms, cauliflower, avocados, stone fruits). Customizing patients’ diets according to personal tolerance yields the best results for digestive symptom management.2 An elimination diet supervised by a qualified RD can help identify all problematic foods. In cases of steatorrhea, the presence of excess fat in the stool, the use of medium-chain triglycerides (MCTs) from coconut oil and MCT oil or supplementation with ox bile can facilitate the digestion and absorption of fatty acids and liposoluble nutrients. Only when digestive symptoms are under control can the abnormal intestinal permeability and inflammation resolve. Optimizing the omega-6 to omega-3 ratio by avoiding high omega-6 seed oils and encouraging cold-water fatty fish consumption can lower inflammation and promote gut healing. Dietitians also should recommend food sources of nutrients commonly lacking in SIBO patients, such as liver and cold-water fatty fish (eg, salmon, mackeral, sardines). Liver is rich in vitamin B12, iron, and vitamin A, while cold-water fatty fish is rich in omega-3s and vitamin D.
The use of probiotics in SIBO patients is controversial.1,2 Although probiotics may worsen symptoms at first, many patients benefit from trying to rebalance their gut flora. A slow and gradual introduction of probiotics free of lactose, inulin, fructooligosaccharides or prebiotics can facilitate patient tolerance. RDs can help SIBO patients optimize their digestion and improve their nutritional status. Customizing the diet and adopting strategies to prevent recurrence make the dietary approach more successful. 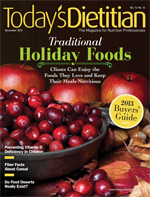 — Aglaée Jacob, MS, RD, is a freelance writer who specializes in diabetes education and digestive health. 1. Pimentel M. A New IBS Solution. Sherman Oaks, California: Health Point Press; 2005. 2. Siebecker A. Small intestine bacterial overgrowth: clinical strategies [webinar]. September 17, 2011. http://ce.ncnm.edu/course/search.php?search=SIBO. Accessed September 25, 2012. 3. Campbell AK, Matthews SB, Vassel N, et al. Bacterial metabolic ‘toxins’: a new mechanism for lactose and food intolerance, and irritable bowel syndrome. Toxicology. 2010;278(3):268-276. 4. Nucera G, Gabrielli M, Lupascu A, et al. Abnormal breath tests to lactose, fructose and sorbitol in irritable bowel syndrome may be explained by small intestinal bacterial overgrowth. Aliment Pharmacol Ther. 2005;21(11):1391-1395. 5. DiBaise JK. Nutritional consequences of small intestinal bacterial overgrowth. Prac Gastroenterol. 2008;69:15-28. 6. Riordan SM, Mclver CJ, Wakefield D, Duncombe VM, Bolin TD, Thomas MC. Luminal antigliadin antibodies in small intestinal bacterial overgrowth. Am J Gastroenterol. 1997;92(8):1335-1338. 7. Fasano A. Zonulin and its regulation of intestinal barrier function: the biological door to inflammation, autoimmunity, and cancer. Physiol Rev. 2011;91(1):151-175.